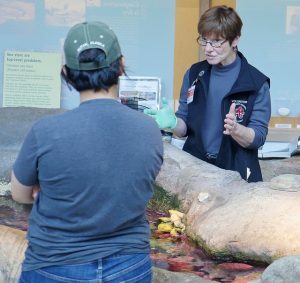 NEWPORT, Ore. – Fifty people who volunteer at museums, aquariums, zoos and science centers will gather in Newport Sept. 28-30 for a conference to network and learn from each other. 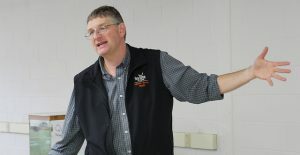 The attendees are members of the Pacific Northwest Docent and Volunteer Association (PNDVA). They’ll meet at the Hatfield Marine Science Center (HMSC) on Sept. 28 and at the Oregon Coast Aquarium the following day. On Sept. 30, attendees will have the opportunity to partake in various excursions in Newport, Depoe Bay, Seal Rock and Otis. 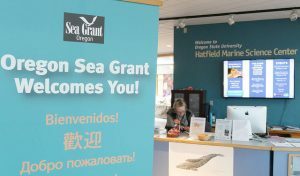 Employees with Oregon Sea Grant, which operates the public education wing – also known at the Visitor Center – at Hatfield, will lead some of the sessions at HMSC. More than 60 people volunteer at the Visitor Center, some of whom will attend the conference.